When designing or decorating a room, I’m always on the lookout for fresh, original and thrifty art for the walls. If I can use wood scraps or leftover materials I already have on hand, all the better! For example, I recently put together a large piece of artwork to display on top of the board and batten in our upstairs hallway. I used some scrap plywood, stain, paint and a vinyl wall decal to create my masterpiece. For a complete list of the supplies I used for this project as well as my step-by-step instructions, head over to Royal Design Studio’s Paint+Pattern online design magazine here. Since we moved into our home a few years ago, I’ve wanted to jazz up the second floor hallway. But a gazillion other DIY projects kept me from taking action. 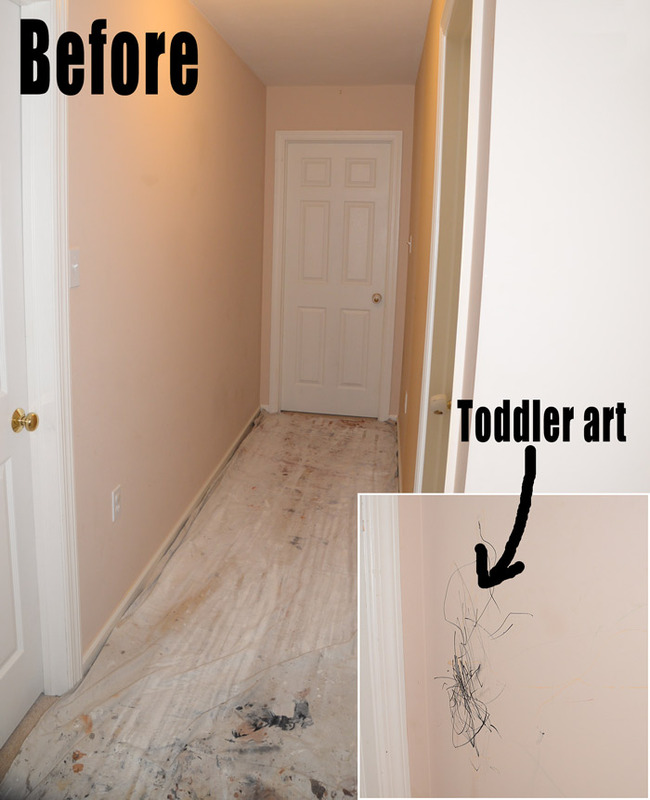 Then our toddler son recently decided to use the hallway as his personal canvas. He created his “art” using a permanent black marker! So the hallway project moved up to No. 1 on the DIY schedule. After much Pinterest searching, I decided to do a board and batten wall treatment in the space, with a narrow shelf at the top where I could display family photos. I started by priming the walls white where the marker damage was done. I didn’t want the black marker bleeding through my finished wall color. Then it was time to begin the board and batten project. Step 1: Decide where the first horizontal board will be placed. I wanted my top board to be flush with the top of the light switches. So I measured down from the ceiling and placed tick marks all along the wall at that spot. 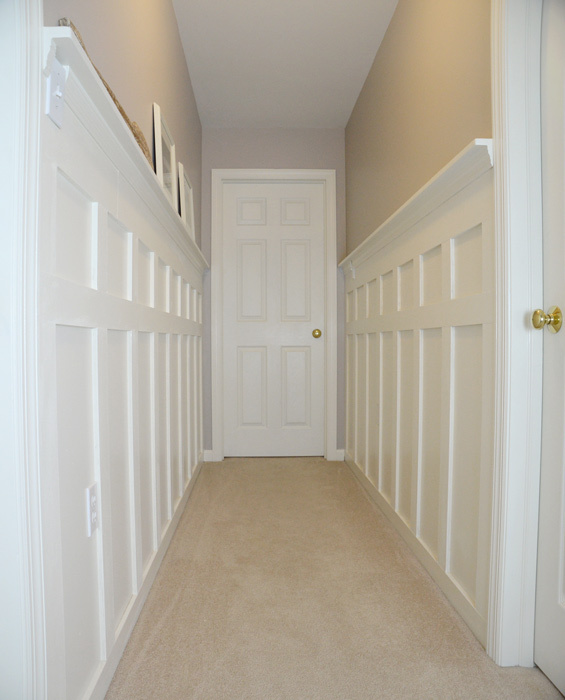 I used FrogTape® brand painter’s tape, placed around the entire hallway, to mark that starting line. 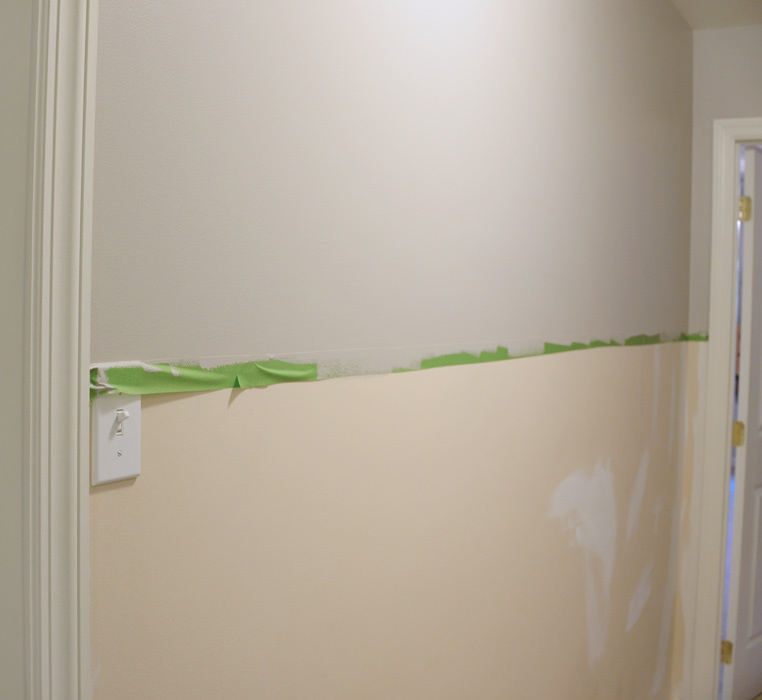 Step 2: Paint the walls to the ceiling above the line of FrogTape. 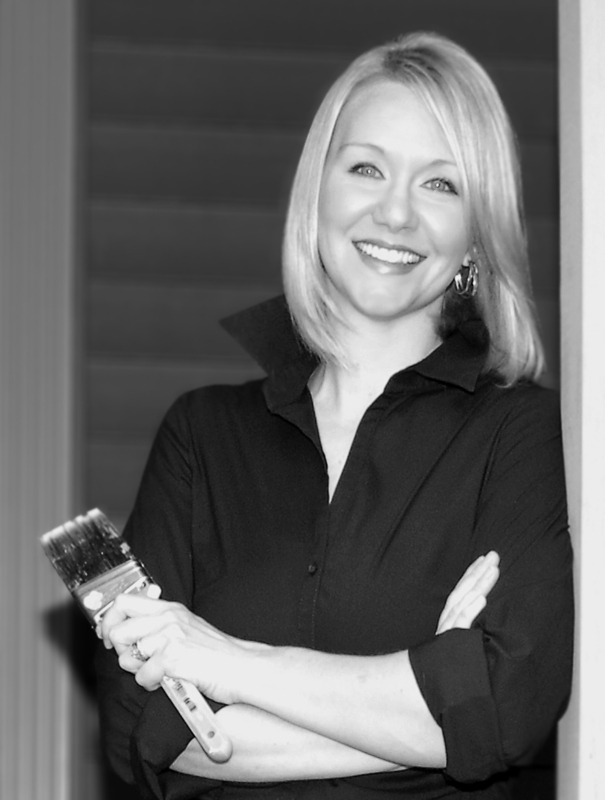 I chose the color Anew Gray and had it mixed up in the lesser expensive Valspar Signature® paint (eggshell finish). I removed the FrogTape and had a perfect line ready for my first board to be added below it. 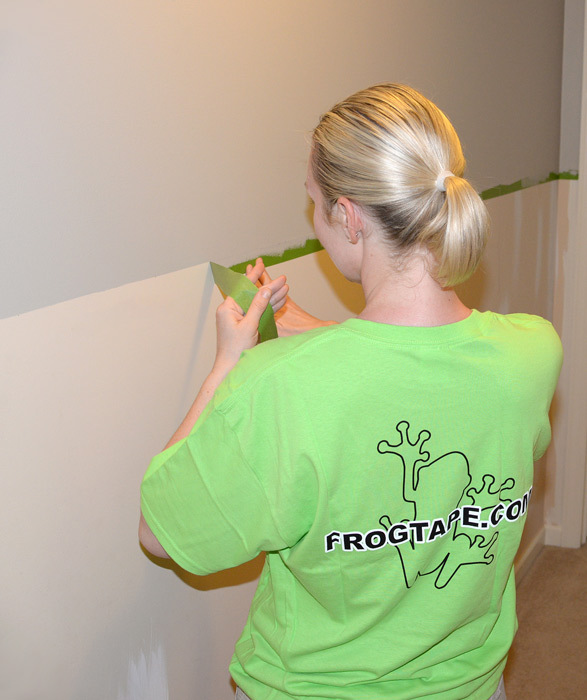 FrogTape will remove cleanly from most surfaces for up to 21 days (or seven days in direct sunlight). 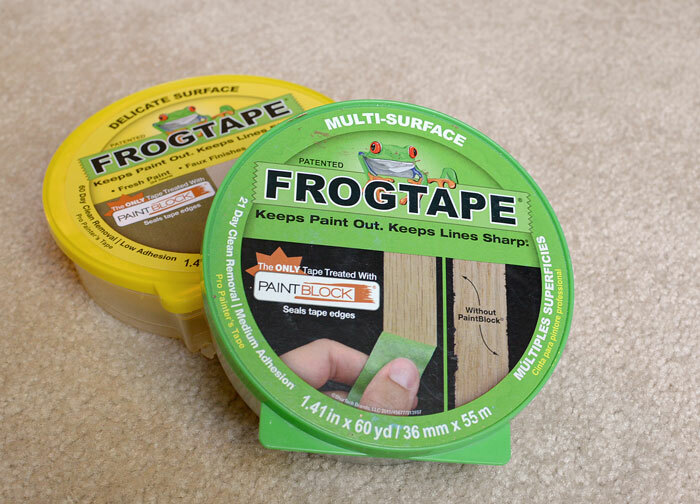 FrogTape not only cleanly comes off of surfaces, but also prevents paint bleed thanks to its patented PaintBlock® Technology. Step 3: Add the first horizontal board to the wall. I chose medium-density fiberboard to create my boards and battens. 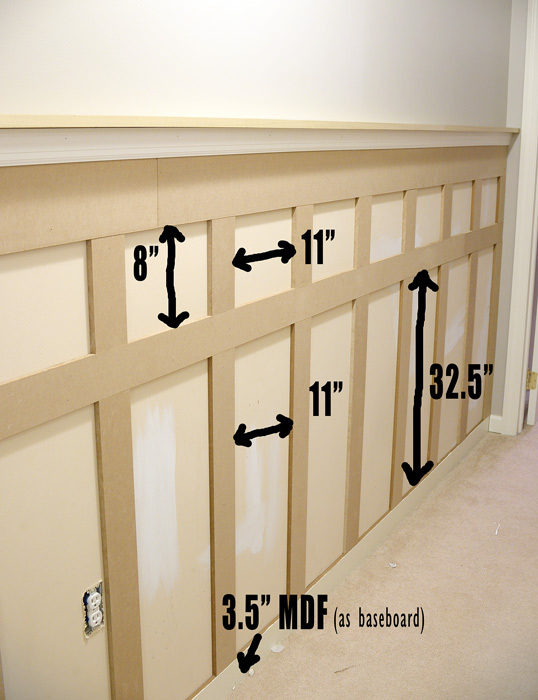 To save money, I purchased three, 8-foot sheets of MDF and had them cut down in the home improvement store. From each 8-foot sheet, I had cut one 7-inch-wide piece; the rest of each sheet was cut into 3.5-inch-wide pieces. For the top horizontal board, I used the 7-inch-wide pieces, placing them directly under my FrogTape line, and using a level to make sure the pieces stayed straight. I applied a bit of panel adhesive to the back of each board and used brad nails to stick them to the wall. Step 4: Eight inches below the top board, add a 3.5-inch board. Step 5: Add baseboard. 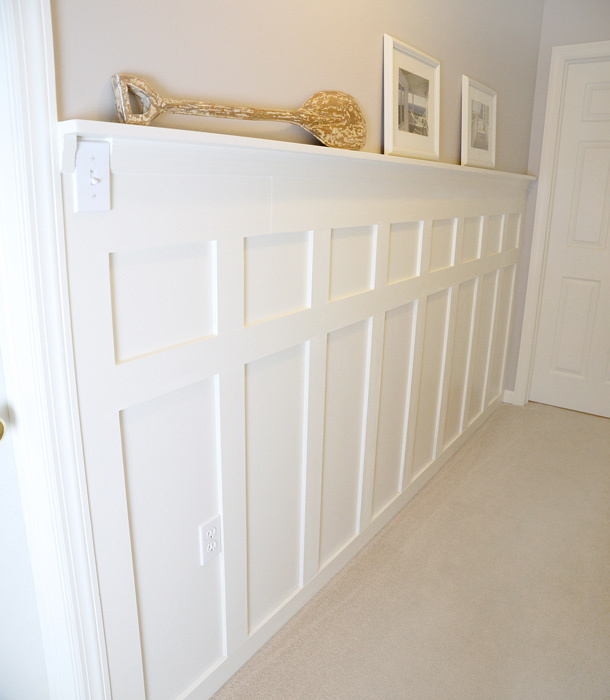 I used 3.5-inch pieces of MDF to serve as my baseboard. 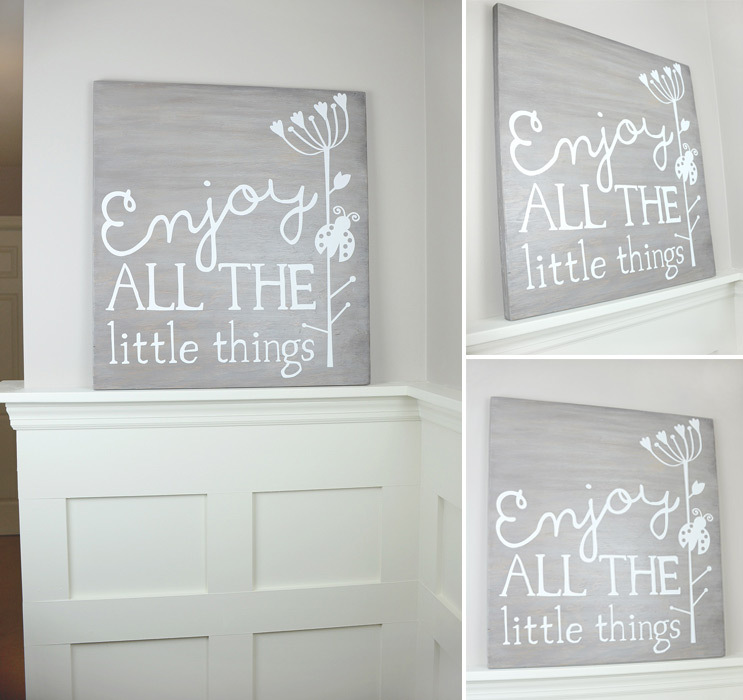 (Be sure to paint these boards prior to sticking them to the wall.) For the paint color, I chose to match the shade of our window and door trim. Step 6: Add battens. 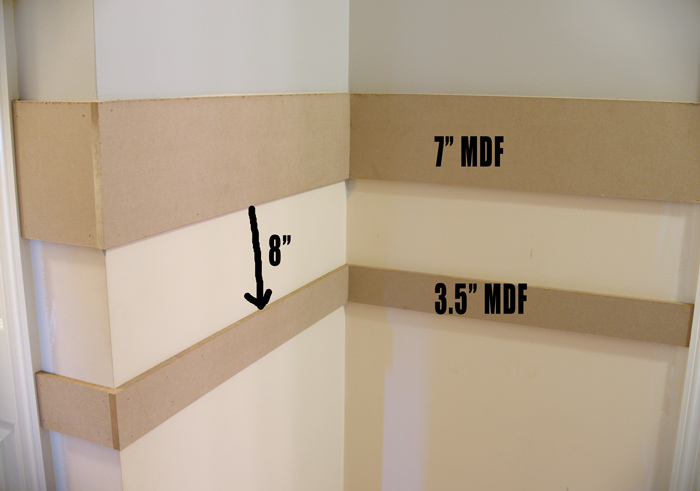 I cut 8-inch battens from my 3.5-inch pieces of MDF and applied them about 11 inches apart on the wall in between the two horizontal boards. I then applied my bottom battens parallel to the top ones. Mine are 32.5-inches long. Step 7: Add the top shelf and molding. 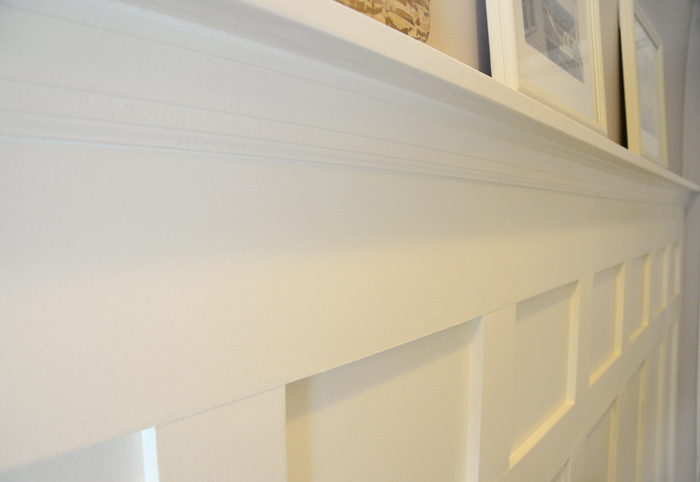 I chose a 1×3 birch board for my top shelf and inexpensive door/window casing for the molding underneath it. Step 8: Sand, caulk and paint everything. MDF can be tricky to work with. It requires a few coats of paint for a smooth finish, so be prepared to put in some hours of work here. But the finished result is worth it! 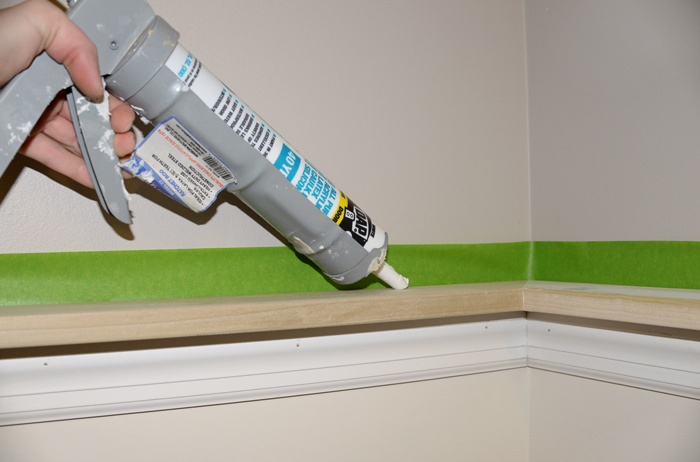 Helpful tip: Use FrogTape to help create a perfect caulk line between your shelf and the wall. This trick helps cut down on cleanup time and gives a professional-looking finish. 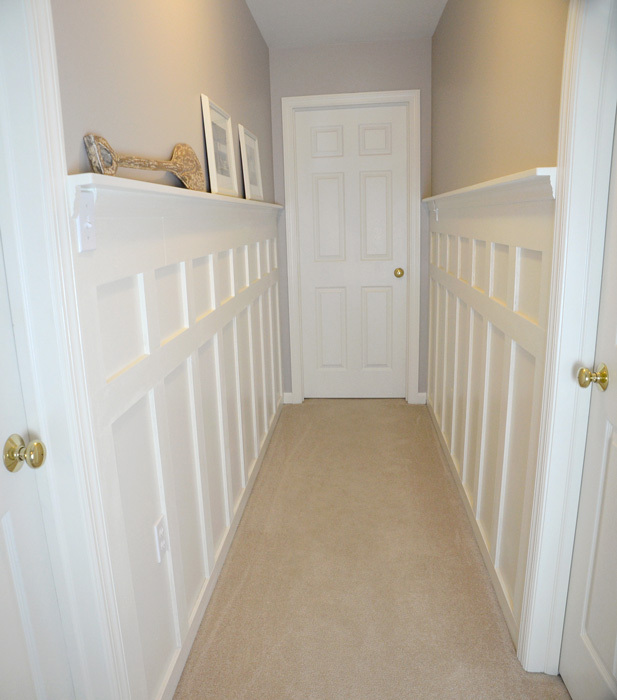 Here’s my new hallway that I built for under $150. 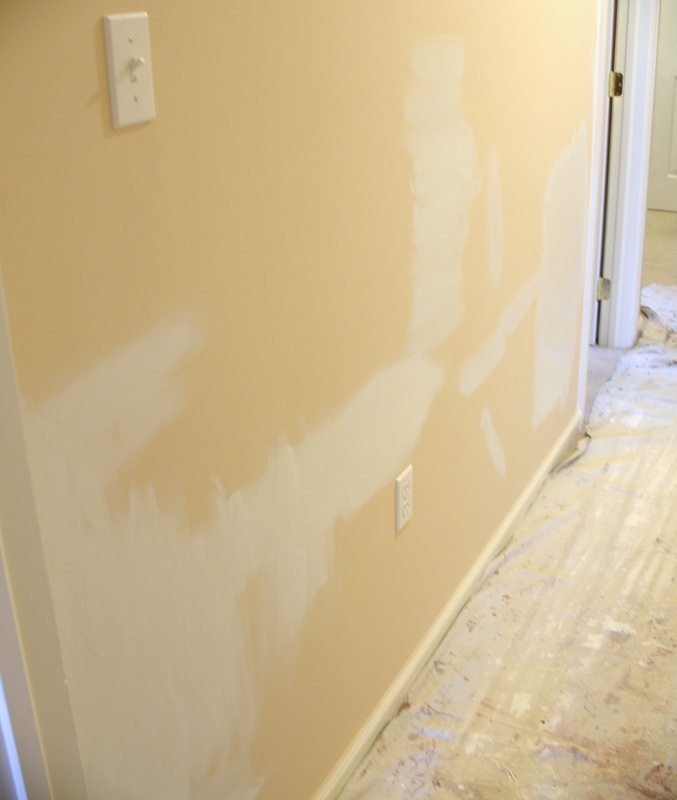 Are you ready to get started on your next DIY paint project? 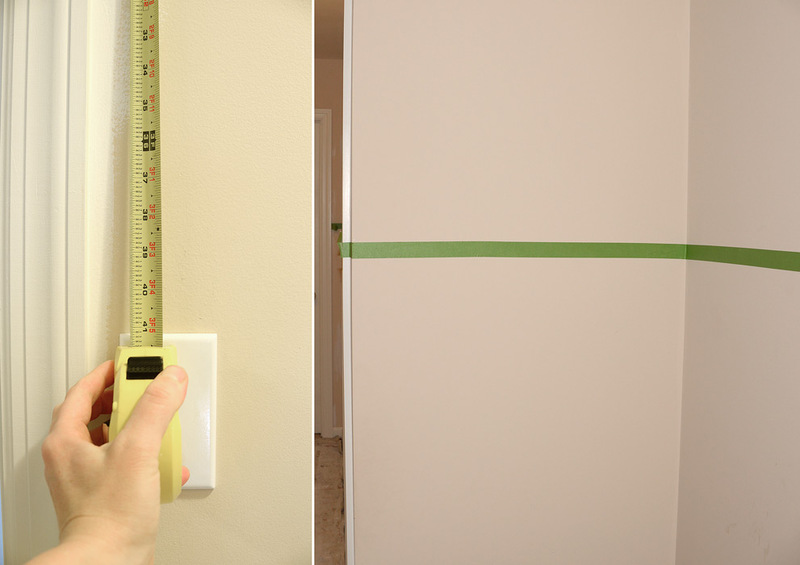 Be sure to enter the Earn Your Stripes Room Makeover Contest, sponsored by FrogTape. To enter, you must re-do a room with the help of FrogTape and submit your photos. You can check out all official contest details by clicking the link above. The winner will receive a $5,000 prize! Also, to get more FrogTape® painting inspiration and product information, visit FrogTape on Twitter, Instagram, Facebook and Pinterest. I’m linking this up to Thrifty Decor Chick.